museeuw mf5 - zurich. carbon flax frame. it seems i may have something tentatively in common with johan museeuw; at art college we had two options for thinning our oil paints - we either used turpentine/white spirit or linseed oil, the latter taking a lot longer to dry, and giving the finished article a rather fetching glaze. why does that make johan and i best of buddies (if only he knew)? well, linseed oil comes from flax, and johan employs varying quantities of this material in his bicycle frames. flax, lest you be uninformed, is a plant that grows in quantity all the way from the mediterranean to india; it's amongst the oldest fibre crops in the world. using flax fibres for linen production is a process that goes back 5000 years. the fibres are extracted from the skin of the stem of the plant, and is stronger than cotton but less flexible - the more coarse fibres are employed in the production of twine and rope. 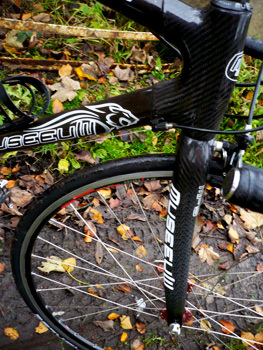 museeuw bikes enlisted the co-operation of ipa composites in belgium to develop the concept of a combination of carbon matting and flax, along with billato in italy to build the tubes and lugs into complete bicycle frames. not all of the museeuw frames use the tube and lug construction - some are made from mitred tubes and a carbon wrap, but the mf 5 zurich is of the former variety. each bicycle sports varying percentages of flax in the tube construction: the mf5 main tubes are 80 percent flax to 20 percent carbon; the lugs are 100 percent carbon, while the rear triangle is 65 percent flax/35 percent carbon. forks are 42/58. the head tube has sort of an outward bulge to itself and contains one of the ubiquitous semi-integrated headsets, this time from a name rarely seen nowadays - frm. the top tube tapers from a thin round(ish) at the seat tube lug to a larger oval where it meets the head-tube. as is often the case with test bikes, the museeuw arrived in a cardboard box, arriving from one of the country's more prominent cycling publishers, and i thought the tube had been scraped along the length. stupidly i kinda missed the fact that the scrape was under the clearcoat - it was the flax fibres. the three main tubes are actually a dark brown colour, in marked contrast to the solid black of the weave on the lugs. the down tube is big at the front, morphing to a triangular shape as it heads south of the bottle cage (incidentally, this is the very first bike i have ever received that had a bottle cage already fitted - joy) towards the bb lug. i'm not so keen on this bit, but purely on aesthetic grounds; it is rather hard to see when you're pedalling. the seat tube sports a rather whizzy fairing that sort of moulds itself to the rear tyre shape - very cool. the rear triangle is 65 percent flax/35 percent carbon with a monostay down to the brake bridge before separating to the rear lugs and the join with the chain stays. the latter run parallel to the wheel plane until about half-way when they form an s bend outwards to the dropouts; hard-core. while bendy forks, a la pinarello seem altogether too gimmicky to me, the museeuw carbon/flax blades are reassuringly thick (laterally) and also form an s bend outwards to the dropouts. the combination of this along with the chainstays give this all black frame a very attractive, aggressive look. it's a bike that looks fast before it's moved an inch. 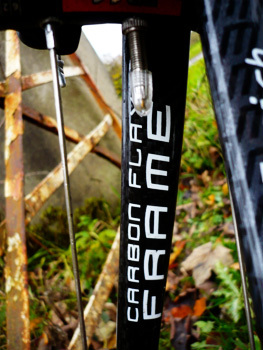 the carbon bars are branded sx force as is the bottle cage and the carbon shelled saddle. it's not too often that you see classic bend bars these days, even less so in all carbon; i love this shape, and i wish that more component folks would pay heed. not a fan of anatomic bars at all (apart from the look, i don't think they help at all with the hand/brake lever interface.) the bars are held in place by an 110mm fsa aluminium stem. groupset on the mf5 is a campagnolo record compact carbon, with 50/36 rings and a (i think) 12/23 ten speed cassette. still not too sure about compacts, especially on islay; i seem to spend a lot of time in the smaller sprockets and the big ring, and i feel as if i'm wasting a lot of gears. still, horses for courses - if i lived in a very hilly part of the world, i'm sure i'd be very grateful. much is made all over the frame, of johan museeuw's legacy as the lion of flanders. 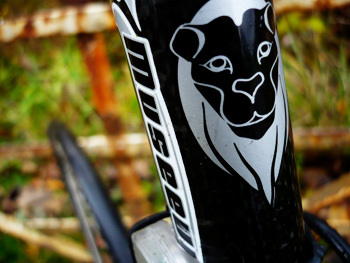 the museeuw graphic on the downtube morphs into al ion's head, and there's a bold lion graphic centre and front of the carbon seatpost. we're also not in any doubt as to the frame's construction method - bold white graphics denote the carbon flax mantra at strategic points on the tubes. 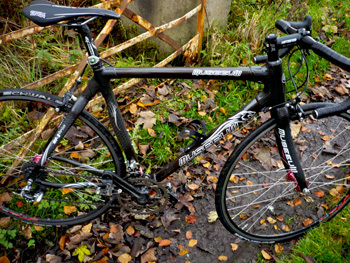 the frame tested bore a 56cm seat tube, and very happily for me, a 56cm top tube. despite this being slightly larger than my normal choice of 54cm, all worked just dinky do. since i use vista magic pedals which sit lower than standard pedals, the seatpost has to be a touch lower than normal to allow for comfortable positioning on the bike. of course this makes all seem wrong in the setup shown in the photos. just so that you know why. the frame arrived in a smaller box than usual because it had no wheels, so i fitted my own chris king customs fitted with schwalbe ultremo r rubber, also on test before uk availability in january of 2009.
it's pretty astonishing to me the lengths to which bicycle designers/manufacturers will go to provide us with the ultimate in rideability. i cannot conceive of the thought process that allied flax fibres with carbon fibre, or indeed the subsequent manufacturing; in most cases these ideas move the envelope a bit further. not everything works, but you can hardly blame them for trying. in much the same way that the incorporation of carbon fibres into a pair of santini shorts, apparently clearing lactic acid from the legs more quickly (!) or the benefits projected onto ceramic bearings, i doubt that i'm the only one to harbour at least minor suspicions about the efficacy of adding rather large quantities of the stuff that makes linen to a high end cycle frame. of course, that's why i sit nightly in front of an apple macintosh laptop, typing endless words about cycling rather than something more useful and concrete by way of useable product. suffice to say, the properties claimed by museeuw for the flax/carbon frame are entirely justified. at the risk of being labeled a petrol-head it's like shifting into a top of the range mercedes. there's a stretch of road between crosshouses and blackrock on the bridgend/bruichladdich road (you know the bit that passes cathie thomson's house? no, i know you don't, but it adds a bit of local character to the review) that was plastered with what i believe is laughingly known as surface dressing, several years ago. since this resembles apple crumble, and lasts about as long, most of the top layer has weathered away, leaving a very rough surface to which skinny tyres do not take kindly. 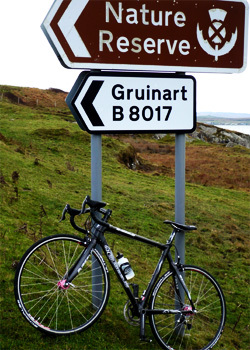 a recent bicycle which was on holiday on islay for a road test, made very heavy weather of this section of road (which is sort of what we use it for), while the mf5 almost paid no attention to it whatsoever. don't get me wrong, you are aware of the crap over which you are travelling, but the frame isolates the rider from the unpleasant effects, meaning that there is almost no reduction in speed - not something that can be said of others. this sensation is in force at all times during any ride; it's something that is very difficult to describe - it doesn't feel like suspension, but it does feel like a magic carpet ride. i'm willing to accept that some of the credit can go to the new schwalbe rubber and the chris king wheels (which really are as good as you figure they might be), but let's not underplay the effect the flax is having here. despite this not being the lightest build that could be achieved (i have to confess, i have no idea of the claimed weight of the frame alone), climbing is a joy, with a really beautiful spring in the step at the bottom of each pedal stroke. handling is steady; there is no discernible twitchiness even at slow speed, while tracking downhill at speed (we all have our limits) was very reassuring. as luck would have it, on a return journey from debbie's in some serious wind and rain (very cold rain, come to that) the bike showed no sign of skittishness, either from side winds or cornering in the wet. that too cannot be said about every bicycle. 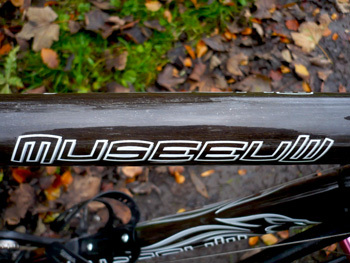 museeuw offer a ten year warranty for registered frames (carried out by the dealer), showing commendable faith in their product. if you have held suspicions regarding the claims being made for musseuw carbon/flax frames (and i know some of you have), you should fear not - as far as i'm concerned (would i lie to you?) they are entirely justified, at least on the evidence provided by the mf5. i think i'll just hang onto this one for a year or so, just to make sure. museeuw price all their frames in euros, so sterling prices will obviously depend on the conversion rate applying at the time. consequently, the mf5 is offered at €3190 a reassuringly expensive £2600 - not an unfair amount to charge for a frame of this quality, and comparable to other carbon fames in its class. each museeuw is available in three colour styles (i've been riding the vantage which is basically naked tubes with a coloured logo) and six colours: amstel gold orange, tour of flanders yellow, paris roubaix red, zurich white, lugano gold, and a limted edition gold and blue. the only remaining, and ultimate test that requires to be made is the banana test, as scientifically designed and constituted by harmontech (©2008). due to the fact that my carefully selected banana for the purpose fell out of a back pocket, this major make or break parameter selection will take place during the coming week.